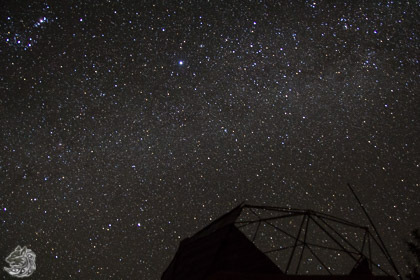 Photographing deep space objects (nebula, galaxies and dust clouds) is challenging, requiring special tools like an observatory. This page is about my observatory. Other pages deal with how to take pictures, and the pictures themselves and a catalogue of the brightest galaxies in the Southern Hemisphere. There are a couple of elements in this build that i have not seen elsewhere: the viewing areas are polygons, and between dome and wall is a 360 degree horizon window. 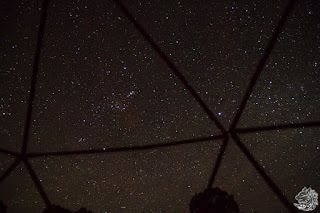 Wide field star panoramas are possible with no more than a steady tripod, a camera (with a large focal length <f/3.0) and dark skies. 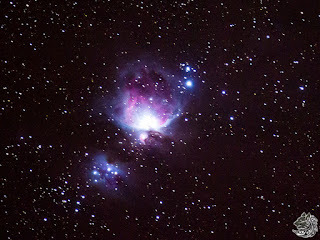 But images of deep space objects require you to collect lots of light over long exposure times. This is difficult because the sky rotates and this blurs long exposure shots. You get star trails, completely missing the faint light of deep space objects. I have tried a couple of different ways of getting something stable enough to allow deep space photography. It took a while to appreciate just how stable the imaging device needs to be to take long exposure shots. The slightest vibration will compromise your picture. The longer you leave your camera shutter open, or the more magnification (zoom) you apply, the greater the chance your photo will blur. I decided to build a more stable viewing platform. It consists of three separate elements: an instrument dock set in a concrete pier, a deck and wall to give access to the pier, and a rotating dome. 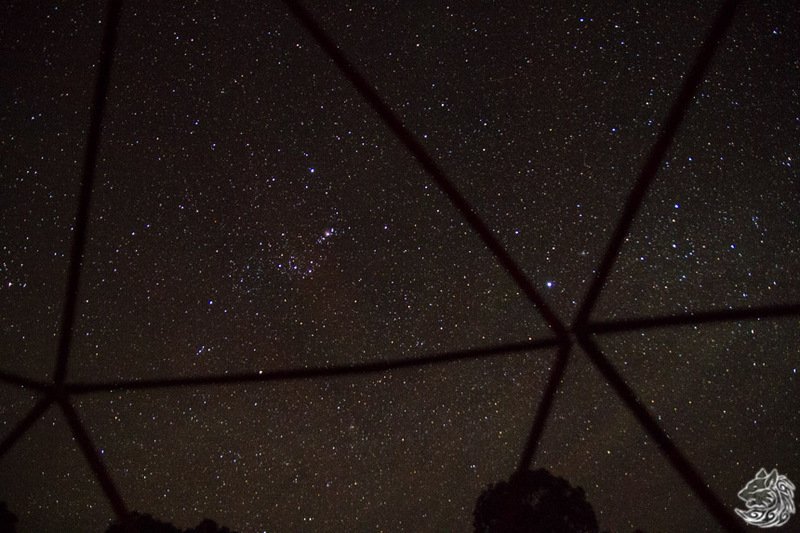 Subsequently I decided to extend the deck to give dome-free access to the night sky with a couple of wind baffles. I am not an engineer, and only have a passing (largely unsuccessful) record of building sheds. i expected to make lots of mistakes. The animation shows how the bits all fit together. Ground vibration is the first problem to overcome. 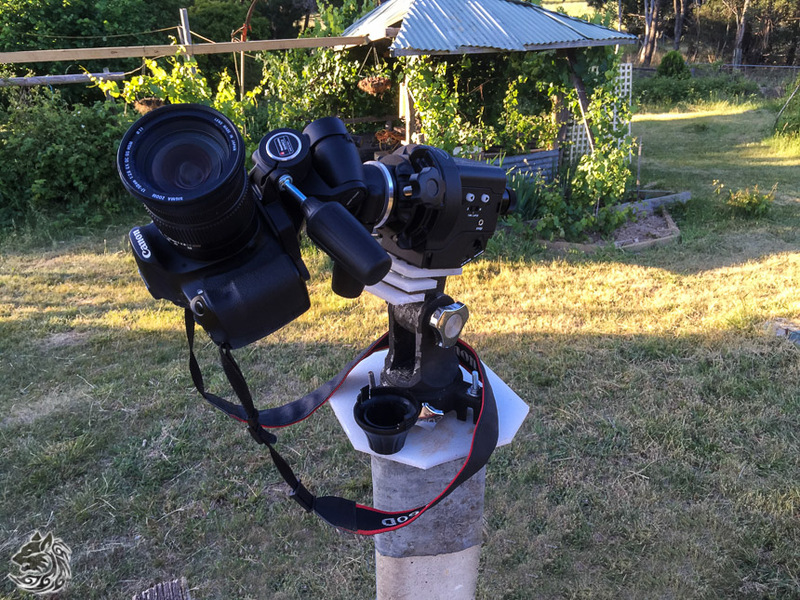 Just walking near a tripod is sufficient to cause small vibrations. At the top of the pier i have built an instruments dock with an equatorial mount aimed at Galactic South (in the southern hemisphere near some faint stars in the Octans Constellation) to carry a variety of different imaging devices (cameras, trackers and telescopes). I use a portable "Star Adventurer" as my tracking device. The device is aimed directly at galactic south (with the accuracy of targeting the top of a nail set into a fence post 1000m away). 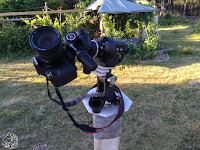 The device then matches the rotation of the sky precisely, allowing me a payload of 5kgs of camera/imaging equipment. 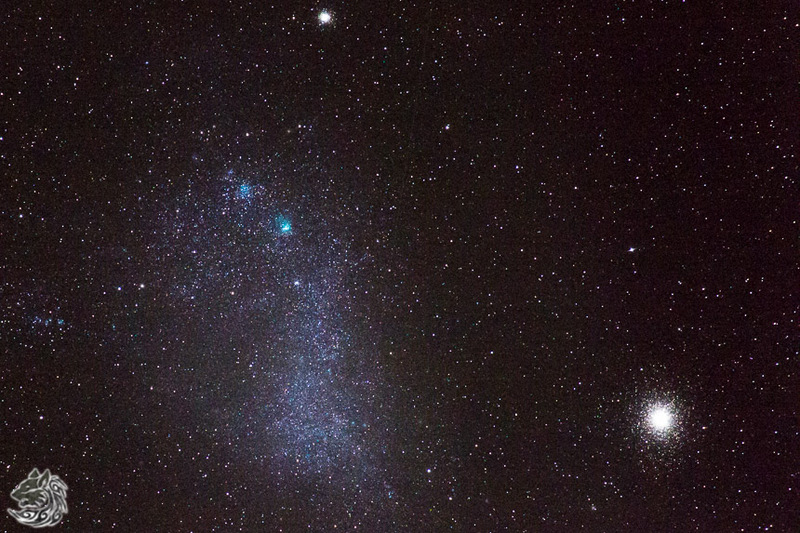 With relatively little work, this is enough to get nice clear deep space photographs. There are a couple of catches. The biggest one is wind. While the pier stops ground vibration, the gear on the instruments dock will start to vibrate with any wind. Less important considerations are the weather, lighting, personal comfort and poisonous snakes. To deal with the wind and other issues (eg, the snakes), i built a deck with a wall around the pier. The deck/wall does not touch the pier, and meets building standards (noting that the walls are not load bearing, unlike most observatories, the walls do not support the dome). Low walls alone will not eliminate the wind problem. In some conditions it contributes to turbulence. In the image below, slight star drift caused by wind gusts can be seen (wind is partly to blame for stars having a slightly elongated 'tear-drop' shape). Still, the deck and wall are great protection from wildlife and the risk of accidentally stepping off into space. The traditional solution for wind and other problems is a rotating dome. 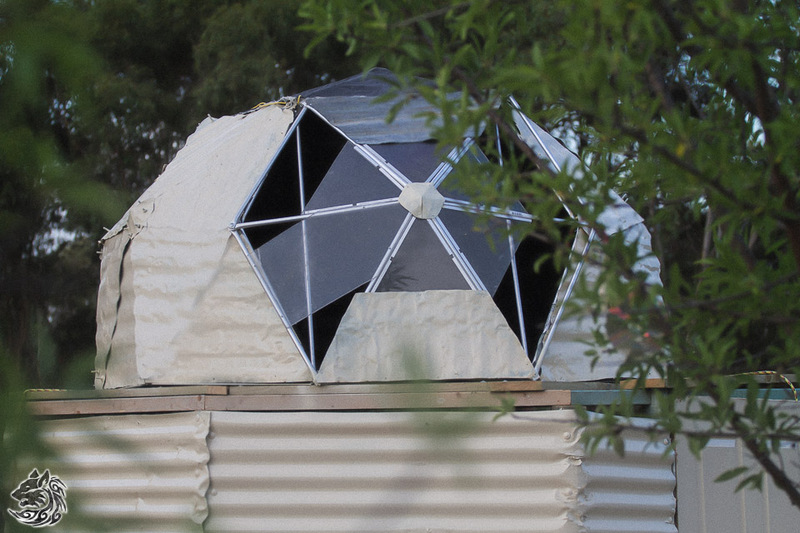 Domes have a narrow aperture to see the sky through, which can be angled away from the wind. 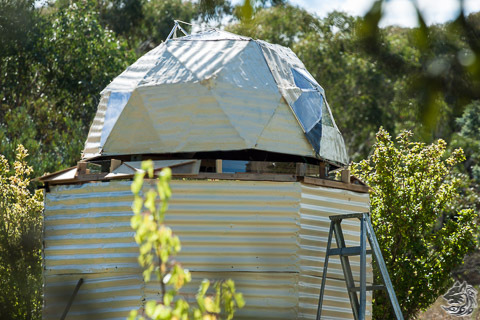 Normally domes have a metal frame and are clad in metal. These do a wonderful job protecting everything from the elements and last for a long time. But these domes are very heavy, requiring solid concrete/steel walls and cranes to lift them into position and service them. The largest are very slow to rotate and, where there are heat variations, the dome can stick. I decided to see if i achieve the same outcome from the other end of the weight spectrum. 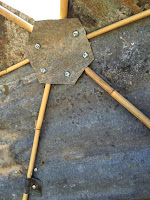 I wondered if i could build a framework from bamboo struts from the vegie garden, structured as a series of polyhedra. Initially i proposed to finish the dome with fiberglass. is easy to use (rotate). Without trying to come to a solution about how i was going to finish the dome, i started to build the polyhedra. My first test effort was with bamboo skewers and superglue. Surprised by the strength of the structures, I built 6 full-sized 5-sided polyhedra out of high quality, well-cured, bamboo. Each polyhedron consists of 5 * 0.6m stakes and 5 * 0.5m stakes. In building, i did not try to get perfect joins. Irregularities in the bamboo and the nature of the construction meant that imperfections tended to cancel each other out. Bamboo is an unusual choice. There are a wide range of framework possibilities. Most people use electrical conduit when building dome structures. It is cheap and easy to work with. Others use metal or plastic piping. My first bamboo polyhedra took about 2 hours to complete as i struggled with different ways of stabilising each joint. 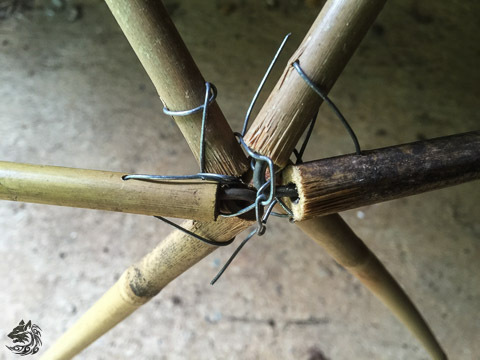 Each join was reinforced by heavy fencing wire with the appropriate angle inside the bamboo. The join itself is held by very light wire inserted into a small drill hole in each bamboo end, pulled together tightly. It does not look pretty but the join is rigid. Once I got up a pace, the time improved dramatically - last one took just 10 minutes. In contrast, an aluminium polyhedra took about an hour to construct (i built 2 for testing), with little chance of time improvements. There were a number of downsides with the metal. Unlike bamboo, my technique of cutting, squashing each end of the metal piping and then drilling screw hole, meant that metal joins with many elements do not end in neat angles, but are staggered, subtlely warping the entire structure ((i am aware you can purchase specialist multi-joints that overcome this issue, but i could not source these). 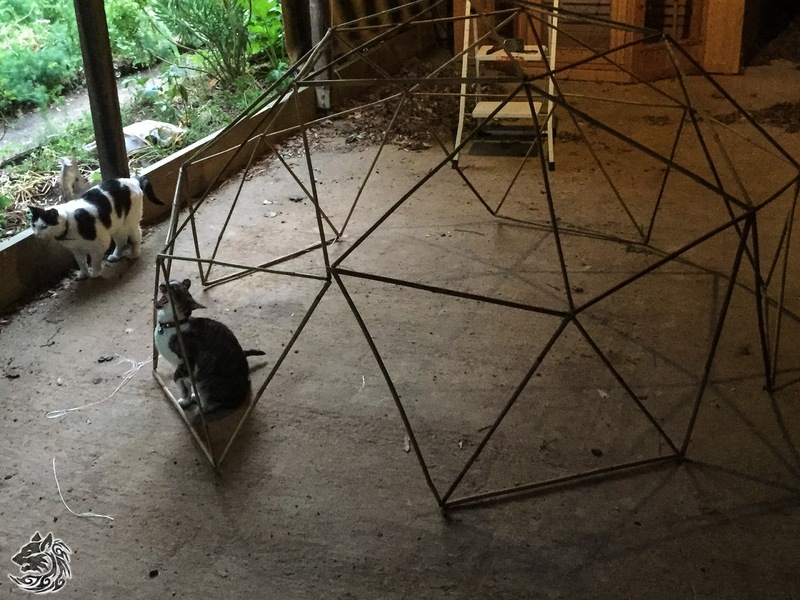 When completed, the 6 bamboo polyhedra were joined together with light wire, and the remaining 5 gaps on the ground level completed with 5 * 0.6m stakes (the picture below shows them without the final 5 stakes (to emphasise how the polyhedra are joined - something i could not visualise until i finished the build). The crafted structure consists of 5-side polyhedra. However, unexpectedly, the build creates alternate overlapping 6-side polyhedra. These polyhedra have very different surface shapes. 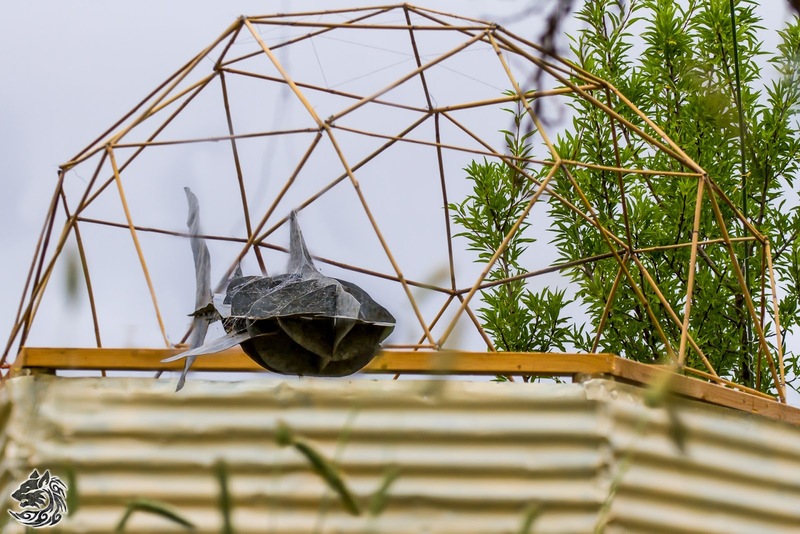 The completed bamboo structure was strong and light, leaving me with a number of options for completing the dome surfaces (i have set out my calculations about weight and force at the end of this post). I initially intended the bamboo shell to be finished with fibreglass. I imagined being able to stretch fibreglass over the structure and cure it over a couple of days without giving much thought to whether i would be creating a separate shell or embedding the bamboo frame. Unfortunately, fiberglass (even woven cloth fibreglass) does not work this way. You need something for the fibreglass to be cured against (fibreglass can bridge small voids, but not the spaces between the polyhedra triangles). Fibreglass shells can be very strong or very flimsy, depending on the weight of the fibreglass sheeting. Strong shells are expensive to craft. Fiberglass works best when it soaks into any external material being used. Finally, fibreglass does not adhere to waxy surfaces (bamboo can be moderately difficult to bond to). After weighing up the options (set out at the end of this post), i clad 80% of the triangular areas in the dome with hammered tin. Tin is sharp and difficult to work with. I lost a lot of blood . In theory, only two shapes of tin are required. However, i chose to craft each piece of tin individually with half having an overhang of 5-10cm on appropriate sides to drain water away from the structure. I will do this differently next time, aiming for just the two sizes and no overlap (instead relying on plastic weather-seals or fibreglass). I used recycled tin. Irregularities were hammered out and existing holes filled. I worked with the dome frame sitting on the top of the deck walls (noting that the dome here is not a roof - it is not fastened to the walls or deck). Working from the bottom, the tin structure became self supporting early in the process. As overhang pieces were bolted or riveted onto other parts of the frame, this created three slight bends in each of the triangles, duplicating the underlying polyhedra structure and creating a strong rigid structure. 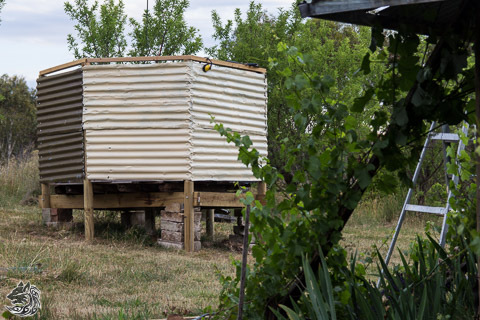 The structure survived unexpected gusts of 50-70kph at its most vulnerable stage and a gust of 100kph when fully complete. The bamboo provided a rigid framework against which the tin cladding could be placed, but it was a less convincing structural element as the cladding continued. As the tin was secured onto other tin pieces, the bamboo structure became less relevant. i began to think that, for all its faults a metal tubing framework would have provided a more rigid framework, with the added advantage of providing additional rivet points. I persevered with bamboo and ended up with a manageable waterproof rigid structure, at the heavier end of the scale i was hoping for. i clad about 10% of the surface area as perspex to provide light, through one triangle and a large circular viewport. The viewport is fun. It is great to look out through it and it is an interesting external feature. 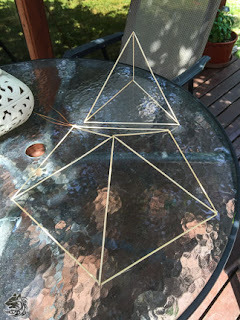 In order to take photographs, two polyhedra (the five sided top and a six sided side) swing open (using metal control wire). I completely recrafted these polyhedra and the surrounding areas in metal to compensate for structural integrity issues. The top was a particular concern because it swings above the dome during photographic sessions and is exposed to wind gusts (the swing area is particularly exposed to rain entry. As expected, the moment i removed the underlying bamboo polyhedra for these two elements, the entire structure lost rigidity and internal bracing had to compensate. I framed the top as a fibreglass shell with embedded cotton sheeting. I framed the side as a complex aluminium and perspex piece, providing lots of angles and shapes, reminiscent of the front dome in a reconnaissance aircraft. In integrating the metal components into the dome i became very aware of the contrasting building materials. Bamboo is very flexible, adjusting to the shape you need it to be. Metal is unrelenting. 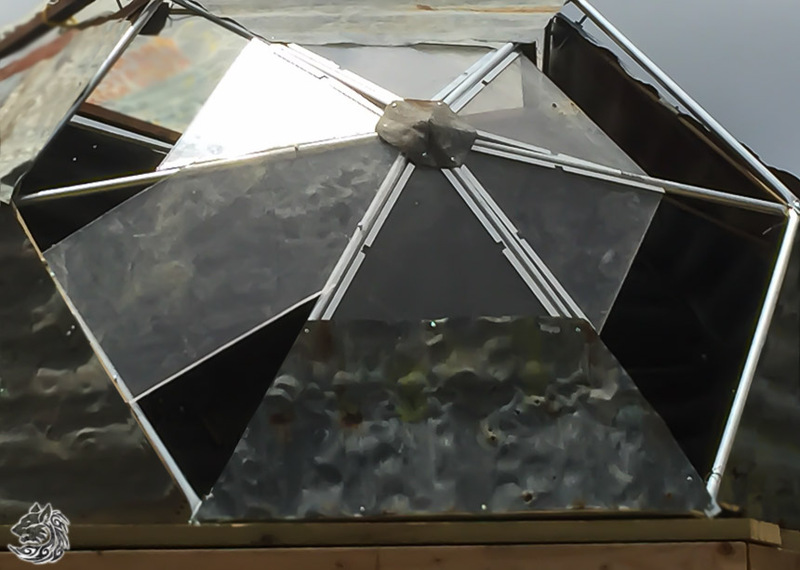 Rivets were liberally applied to the external structure to finish integrating the metal triangles into the dome shape. Finally, when the surfaces were stabilised, 2" fibreglass strips were applied along the edges of the overhangs (perhaps overkill at this point, but it gave a more uniform finish and forced me to take a careful look at each of the surfaces). While it started to look a little more spherical, i decided early on to keep angular discordant features in the dome, to emphasise its provenance. I applied a thick bitumen finish to give the structure a bit more chance at being waterproof (and cover up some of my mistakes). As tin rusts, i also applied an anti-rust surface treatment before covering with metallic paint. It took a little while to achieve smooth rotation of the dome under different stress conditions. Final external configuration, showing the ring of horizon windows just below dome. The dome (10 sides) and the walls (6 sides) have fundamentally different shapes and do not play well together. Worse, they conspired to let water in. In this build, the dome spins from the floor of the observatory (rather than the conventional 'top' of the walls). I chose this approach for safety reasons. Placing the dome (even a relatively light dome) onto the top of walls can add a great deal of stress on walls the moment the wind picks up. Instead, here, the dome is placed on the equivalent of braced stilts and are tied directly to the concrete piers at ground level. At high wind (a cyclone passed within 900m after completion with winds gusting 150 - 200kph) the dome structure flexes and distorts (before snapping back into shape) but does not break. Four supports hold the dome about 6 inches above the top of the wall (allowing for additional side windows and better water run off). There are two separate wheel systems in play: the guide system and the float system. The guide wheels follow a track on the floor to ensure smooth rotation, under wind and temperature stress. The float wheels provide 360 degree movement, making it easy to move manually or by motor. The supports are braced and stressed to provide for slight flexing. Connecting the top of all the supports is a single 'L' shaped metal bar, in the shape of the dome base and firmly connected to the dome. A series of clamps lock the dome securely to the deck after use and in the event of wind. Finally, solar panels feeding a marine battery were added to power the electrical system and internal lights added. The structure was painted (a cream exterior and black interior). During construction a large separate facilities building was delivered to the site (sitting under the east facing horizon) to house remote sensing and launch equipment. The solution to having lots of access to the sky was simple, i will simply extend the deck outside the observatory to create a raised viewing area for binoculars and a solar scope. This external deck will be added at the same time as landscaping, paths and external lighting. 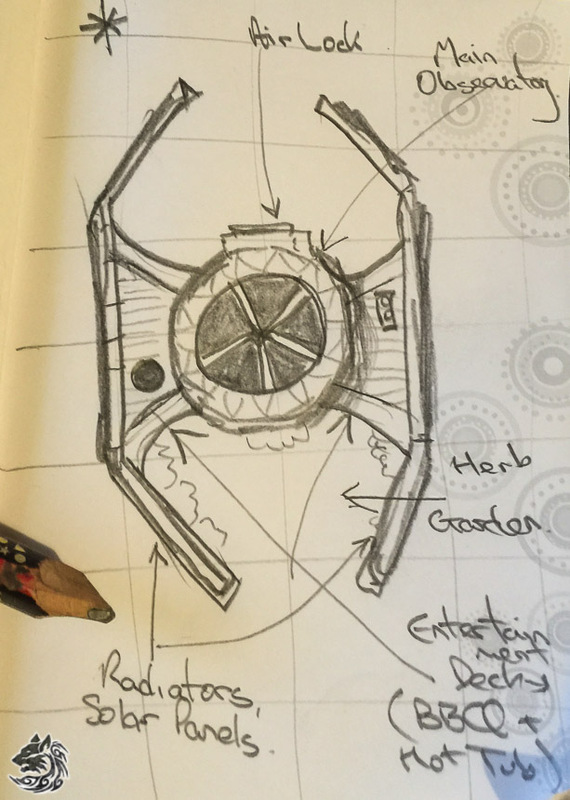 The remainder of this post sets out options etc that may be of interest to others thinking of building a dome. Bamboo is great for a quick, one day build, to be covered with tent-like material. Metal is great for permanent structures. When complete, the bamboo structure spent a day in a stiff wind settling into a perfect form. To test the weight bearing capability of the structure I added mass to the top of the structure measuring effects on the shape and stability of the structure. Under external vertical stress the structure flexed but showed no signs of collapse when i stopped adding mass at 250 kg (which is the breaking strain of the light wire i was using) - giving a maximum vertical stress rating of about 2000+ Newtons (F=m*a, a=9.8m/s2. m=250kg). Each structure will be a little different, and performance will vary according to the cure strength of bamboo and the type of wire used. The vertical stress of a similar metal frame would be far higher. Because this 'strength' is systemic, it seems fair to assume that similar results would apply to lateral force as with vertical force (once the lower elements are braced. Removing any reliance on tie-wire by providing internal bracing at joints (structural) and between nodes (stress wire), will significantly increase stress performance. A final clad mass of 50kg (where the cladding contributing no additional strength) would give it a constant gravitational load of 500 Newtons, well within the simple stress test above. Calculating the pressure under different local wind conditions, is a more complex process. Given the shape of the structure set in an orchard any calculations will be a bit hit and miss (and will vary as trees grow). A hollow semi-sphere looks streamlined but actually has a bit more drag coefficient (.38) than an ordinary family car (.29) - and the wind pressure will impact significantly differently on parts of the structure - particularly vertical elements. At ordinary (98% of the time) wind speeds <10kph, the pressure is 2-4 Newtons. At 50kph (<1% of the time), this raises to 65-130 Newtons and at 100kph (once every few years), 260-500 Newtons. Because pressure grows exponentially with wind speed, it will finally hit 2000 Newtons at 200 - 280kph. At 280 kph, i expect that the dome will split into 6 small flying saucers and they will travel across the Tasman sea before landing somewhere in New Zealand. I was not to know that cyclonic winds would test the structure within months of it being built. A cyclone passed within about 900m of the observatory with winds that destroyed a number of houses. A mass of 30 - 50 kg appears well within the capacity of the structure. A final consideration is that i need it to rotate as well. Too much weight will make that difficult. I chose hammered tin over fibreglass as the major building component after considering a wide range of possibilities (organised by weight). 1. Do nothing (1kg, $0) A viable option is to do nothing other than throwing a tarpaulin over the bamboo framework after sessions. This does not deal with the wind problem. 2. Tent/parachute skin shell using industrial strength velcro. (3kg $500) Instead of a rigid dome, one possibility is a simple, removable skin. With minimal interior wire bracing, the bamboo structure might withstand significant wind gusts, however, it would be problematic with hail. Still, it leaves open the possibility of the frame being used to put up temporary wind shielding. 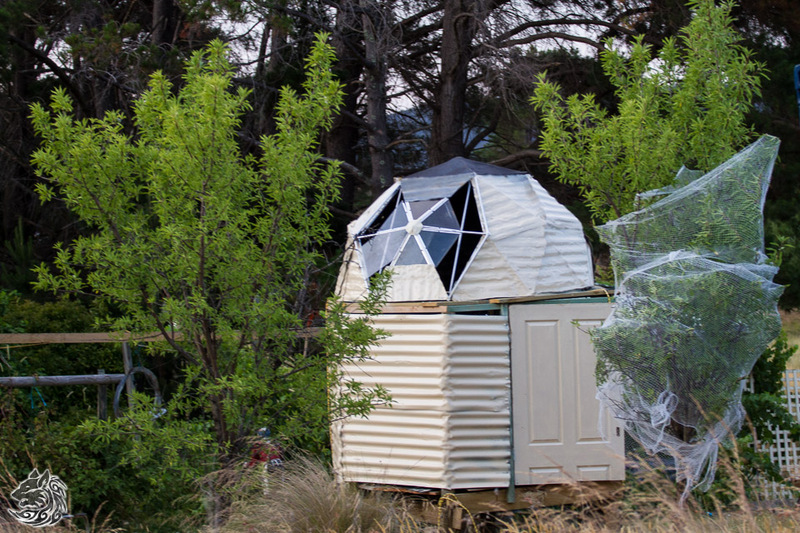 +Matthew Fowlerreported "I have seen guys at star parties with wind shelters created out of stakes and canvas, which seems to work well for a mobile setup. Usually with a slight lean to divert the airflow upwards rather than block it.﻿" Velcro might be used to attach panes or groups of panes to the frame as required. 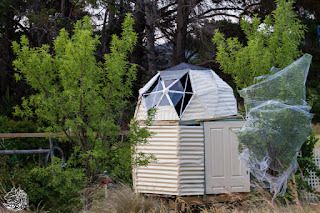 This has the singular advantage of allowing the dome to be stripped if wind conditions permit (thanks +Nina Anthonijsz). 3. Embedded** fibreglass and cotton (14 kg $1000). One low weight option is to deliberately enclose the bamboo in a light media that will take up the fibreglass resin. Based on a spider's web, in one test i wrapped cotton tape around the polyhedra structure which was then embedded within the fibreglass structure. This configuration retained the structural strength of the bamboo frame using half the amount of fibreglass/resin. Cotton does not take up too much resin and retains its shape (unlike cardboard), creating a nice light relatively firm structure. A similar result can be obtained from used unwaxed stock-feed bags and perhaps hessian. 4. Embedded** fibreglass and MDF* (19 kg $1500) MDF provides a rigid crafting surface - but, in an embedded shell probably contributes little to structure while absorbing a small amount of resin. 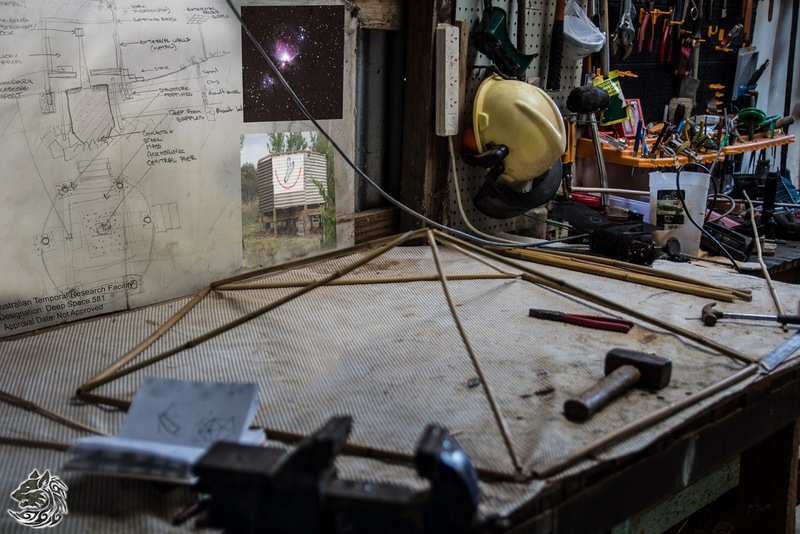 It is probably a better external shell option (using light wooden MDF composites supported by wire between each of the triangles of the structure) - in this form the framework could be used to cast an indefinite number of polyhedra. 5. Hammered tin and perspex* (20 kg $0) While recycled tin can be used, the preparation time for each piece is high, as each triangle has to be cut using tin snips. I had initially discounted roofing tin as a candidate, even though i have a large amount carefully stacked for building sheds as i need another one. Tin has a lot of benefits. I initially looked at this as a simple way of hardening the join points and found that integration with bamboo is relatively straightforward and window/etc elements could be hinged as required. Tin has some disadvantages. It can both tear and bend. Tin snips leave jags that cut and tear the skin. 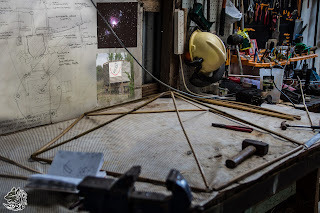 With maximum length of 65 cm, and along all 3 sides of each triangle a facing piece at a slight angle to the first, the structure braces the tin components - which is then interconnected by cold rivets and bolts. Flat roofing tin or clear perspex cut into triangles and riveted into place provides a very strong shell. 6. Embedded** fibreglass and cardboard (21 kg $1200). Cardboard has been used in both external and embedded shell structures. In an embedded shell structure the cardboard absorbs a lot of resin adding a bit to final rigidity. However, in testing it lost its original shape, became heavy (absorbing a lot of resin - hence the extra cost) and sagged. In an external shell, the cardboard is protected by light plastic from being incorporated into the fibreglass mix. Some nice and many horrible structures have resulted. 7. External** fibreglass shell (28kg, $1600 plus cost). I was taken back by the cost of fibreglass and limited retail supply. Sourcing on the internet gave greater options and halved the price. Surprisingly, a number of local commercial suppliers of fibreglass have recently gone out of business. Initially i assumed i would get satisfactory results with 2 coats of relatively light fibreglass sheets. I found i needed heavy sheets and a lot of resin to get a rigid structure. To create a shell, i superglued cut-up waxy stock fee bags to the bamboo frame, applied resin, then the fiberglass cloth with more resin - and repeated. When the fiberglass cured, the frame and stock bags could be pulled away from the shell. *note 1: if using wooden composites or tin to help with the form, the question must be asked why bother with the bamboo at all? i think bamboo is useful because it creates a simple stressed framework without having to glue lots of relatively heavy wooden/tin triangles into the right configuration. The bamboo structure creates a 3D form for crafting and fitting other elements. Others have had great results from wooden/metal structures not using formwork like bamboo but the work involved is intensive. 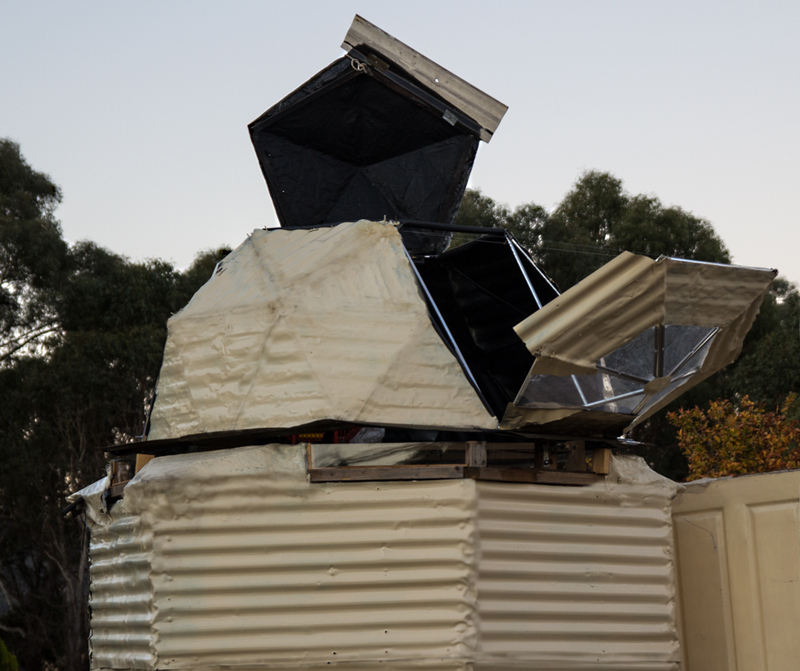 ** note 2: In finalising the dome, there are two technical considerations. 1. 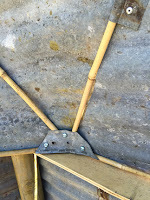 External shell: The first is to cast the fibreglass (or other permanent skin - tin) on the exterior of the framework (not including the bamboo and any material used to support the fibreglass during curing in the final structure). I have seen fibreglass used in this way to build kayaks - the original boat is covered with a waxed material (wax paper, light plastic, some types of 'duck tape' or gel), the fibreglass is applied to the hull and when cured cut away from the original. Finally the new shell is glued together and you have cloned your original kayak. However, if you do not use enough fibreglass, the structure will have the structural integrity of a plastic bag. 2. Embedded shell: The second option is to cast the fibreglass around the framework, embedding it in the final structure. This increases the final weight and imparts whatever structural integrity/weaknesses the form work has into the final structure. Sometimes, to overcome this problem, the formwork is sandwiched between two layers of fibreglass. These results came as a bit of a shock. On a weight/cost basis fibreglass is difficult to justify as the main building material. As i tested the bamboo framework, a traditional 'slit' opening started to look like it would be a major problem. It would cross a large number of polyhedra (the traditional approach would have involved cutting a viewing slit 300mm wide across 4 polyhedra making up the shell creating obvious structural problems that would need to be compensated for within the dome build - using metal bars and stressed wire). I considered a couple of different options. 1. Vertically Split dome shell: splitting the dome into two halves would allow the halves to be moved to reveal the sky. There are a couple of variants. The sides could be both folded away, one could be folded (leaving a wind shield) or they could be slid apart. Each of these create structural integrity problems and complex patterns of wind turbulence. 3.Umbrella: A late possibility was an umbrella type structure, capable of morphing from a low profile into a solid roof. This is not a frivolous suggestion - bamboo has been used to create just such a structure which is extremely light and portable. However, I did not pursue this because the design is dependant on the surface material creating a flexible but rigid surface - something difficult to reconcile with the need for an opening.